Though every pregnancy book lays out the process of labor and vaginal delivery in great detail, most only dedicate a few pages on what happens during a c-section. Whether your baby is breech, you’re having a scheduled repeat, or if you elect to have a c-section for other reasons after consultation with your doctor, it’s still good to know exactly what to expect. Having attended dozens of cesarean sections in several different hospitals, I’ve noticed that the process is very similar no matter where you deliver and I hope that this post provides a bit of insight into it! Most hospitals will have you arrive two hours before your surgery time. You’ll be asked to refrain from eating and drinking 8 hours prior to the procedure to decrease your risk of inhaling stomach contents into the lungs in case you end up needing general anesthesia in an emergent situation. You’ll be admitted to the Labor & Delivery floor and will most likely be weighed and asked to give a urine sample. Over the two hours prior to the procedure, you’ll be a very popular person! Your nurse will put your baby on the external monitors and you’ll have an IV placed for some fluids to start running. You’ll have a chance to speak with your OB and sign the surgical consent forms, as well as an anesthesiologist, who will go over the plan for pain management during the surgery and recovery and answer any questions you may have. Once you are ready to go back to the Operating Room, you’ll likely walk back. Though there are several options for pain management during a scheduled c-section, the most common is a spinal block. The spinal will be placed in the OR while you are sitting upright with your back arched to resemble the letter “C” on the operating table. This should take between 10 and 15 minutes. After the spinal is placed, you’ll lie back on the operating table and a Foley catheter will be inserted to drain your bladder during the surgery to ensure it stays empty and out of the way during the operation. A nurse will apply SCD booties, which will stay on during surgery and the immediate postpartum period while you are unable to get out of bed to prevent deep vein thrombosis (DVT). Soon after, the anesthesiologist will ensure that the spinal is working properly by poking your belly with a sharp object. Once it is confirmed that you can feel only pressure, not pain, near the surgical site, the nurses will clean your belly with an antiseptic and put up sterile drapes. Most hospitals only allow one person in the OR with you, and they will be brought back to sit on a stool right next to your head once all of these steps have been completed. Now it’s time to meet your baby! The surgery itself takes between 30 and 45 minutes, though the baby should be born within about 5 minutes of incision time. Some c-sections take longer, especially if you’ve had one or more before since scar tissue takes extra time to get through. After your baby has been born, your partner will be allowed to go over to the warmer and take pictures. The baby will be dried off and examined while the doctors are delivering your placenta and stitching you up. Depending on the hospital you deliver at, the baby will either go to the nursery for monitoring soon after birth or stay with you and your partner in the OR. Be sure to ask your care provider what your hospital’s policies are! Once the surgery is completed, the nursing staff will clean you up on the operating table and give you a new gown. You’ll be wheeled to the Recovery Room, where you can expect to remain for 2 to 3 hours after the procedure is completed. During those hours, both you and your baby will be closely monitored by the nursing and medical staff. A nurse will perform fundal checks to make sure that your uterus is clamping down appropriately and you aren’t having excessive bleeding. She will also monitor the baby’s vital signs. You will have the opportunity to initiate breastfeeding in the Recovery Room and may want to ask your nurse for advice on getting a good latch right away. Though you’ll likely have family and friends that are eager to meet the baby, it is usually best that they wait until you are recovered from surgery and moved up to a postpartum room to visit. The prospect of having surgery can be scary, but know that a scheduled c-section is significantly calmer than an unplanned or emergency one. You’ll notice that the staff is much more relaxed, no one is in a hurry and there will be time for all of your questions to be answered. If you are interested in a gentle cesarean birth, you may want to check out Danielle Repp’s recent post and ask your obstetrician if it might be an option. 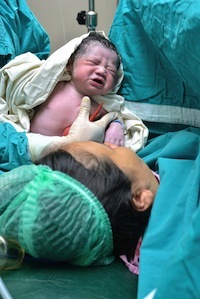 A cesarean birth can be just as empowering and special as a vaginal birth so long as you know what to expect and discuss your wishes with your care provider ahead of time.